The manufacturing PMI for each of Europe's top three countries is in decline. Recession will follow. The Markit/BME Germany Manufacturing PMI - Final Data shows PMI at 17-month low, in contraction. Summary: The seasonally adjusted final Markit/BME Germany Manufacturing Purchasing Managers’ Index ® PMI fell from 51.4 in October to a 17-month low of 49.5 in November, signalling contraction in Germany’s goods- producing sector. The headline PMI is now seven points lower than at the beginning of the year and remained below its long-run average of 51.9. The headline index reading followed an earlier ‘flash’ estimate of 50.0. Comment: Oliver Kolodseike, economist at Markit and author of the report said "German manufacturers continued to record growth of production in November, but this expansion seems to be based on increasingly shaky foundations. In particular, output expanded despite lower backlogs, falling stocks of finished goods and the sharpest drop in new orders for almost two years." The Markit France Manufacturing PMI Final Data shows French manufacturing sector contraction continues in November. Summary: Operating conditions in the French manufacturing sector worsened further in November. The headline Markit France Manufacturing Purchasing Managers’ Index ® PMI slipped to 48.4, from 48.5 in October. The latest reading was the lowest in three months and indicative of a moderate rate of deterioration. Production at French manufacturers fell for a sixth consecutive month in November. The rate of contraction was little-changed from the moderate pace recorded in October. Output decreased in line with another drop in the level of new orders received by French manufacturers during November. The latest reduction in new work was the seventh in successive months, with the rate of decline accelerating to the sharpest since August. Panellists linked the latest drop in new orders to fragile economic conditions and tight household finances. New export orders fell again, albeit modestly and at a weaker rate than one month previously. Comment: Jack Kennedy , Senior Economist at Markit , which compiles the France Manufacturing PMI ® survey, said "The French manufacturing sector showed no sign of shaking off its malaise in November, posting another month of modest contraction. The sector continues to struggle in the face of weak demand conditions, with another round of output price cuts failing to prevent new orders falling at a sharper rate. Data suggested that the domestic market remained the main source of weakness , reflecting the wider sluggish performance of the French economy." The Markit /ADACI Italy Manufacturing PMI shows manufacturing output falls slightly, weakness in new orders continues, Employment falls at fastest rate since September 2013. Summary: Italy’s manufacturing sector continued to contract during November. Despite growth in export orders, output was reduced for the second month running as total new business fell again. Weakness on the demand side led to further contractions in manufacturers’ purchasing activity and employment, with the latter dropping at a faster rate. Meanwhile, producer prices increased slightly as firms faced a rise in average purchasing costs. The headline Markit/ADACI Italy Manufacturing Purchasing Managers’ Index PMI registered 49.0 in November, unchanged from October’s 17-month low. The index has now registered below 50.0 – signalling deteriorating business conditions – in three of the past four months. The Markit Eurozone Manufacturing PMI Final Data shows Eurozone manufacturing stagnates as big-three nations contract. Summary: The slowdown in the eurozone manufacturing sector continued into November, according to the latest PMI surveys from Markit. 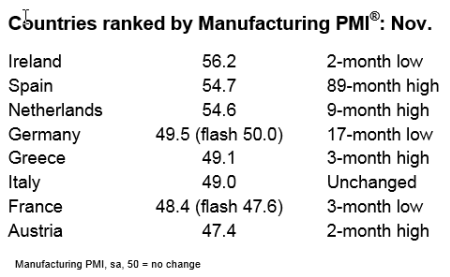 At 50.1, the final seasonally adjusted Eurozone Manufacturing PMI ® was only slightly above the no-change level of 50.0 and below its earlier flash estimate of 50.4. Five out of the eight nations for which data are collected reported contractions in November, the highest proportion since the current recovery in euro area manufacturing began in July last year. Comment: Chris Williamson, Chief Economist at Markit said "With the final PMI coming in below the flash reading, the situation in euro area manufacturing is worse than previously thought. Not only is the performance of the sector the worst seen since mid-2013, there is a risk that renewed rot is spreading across the region from the core. The sector has more or less stagnated since August , but we are now seeing, for the first time in nearly one-and-a-half years, the three largest economies all suffering manufacturing downturns. Germany’s export engine has stalled, causing the steepest deterioration of new orders in the country since December 2012, and new business is also falling in both France and Italy, boding ill for production in coming months." It's safe to assume Spain, Ireland, and the Netherlands will not stop a now baked-into-the-cake overall European recession.